I don’t know how to pronounce that either. The various reasons for this include: lack of clear instructions or of clear goals, limited time, uncertainty as to what is important, meaning of the eventual grade you get or give… All of these apply to the gradee as well as the grader. Becoming the man behind the grading curtain impressed on me the relative importance of grades: Some other student similar to me will grade this assignment! Hmmm, maybe I shouldn’t base my entire self-worth on his or her assessment. Grades are important, but it’s easy to forget that they are far from everything. As an engineer, my biggest criticism of grades is that they are a set of very lossy dimensionality reduction exercises. An example of dimensionality reduction is taking the projection onto the x axis of an input point in two dimensions. We are left with only half of the information we started out with. As you can imagine, in the case of grading an assignment, the afore-mentioned point in two dimensions becomes an input “assignment” point in a m dimensionality input space. These input dimensions can include formatting, grammar, spelling, presence of required keywords, justification, good logic and so on. Where before we were only losing one dimension-worth of information, we are now losing m-1 dimensions of information after the reduction! Obviously the resulting grade is a poor representation of the input work… Did I mention I study engineering? For better or for worse we have to work in this system and it’s not clear to me if there even is a demonstrably better system (let me know if you think there is!). Being a grader can help you understand the system and its limitations though and it helps you focus on other things than grades as sources of feedback on work. I know it helped me take down the importance of grades a peg or two. It’s also a great way to know your audience, so that you know what to aim for the next time you are graded. Being both a grader and a gradee, you have a better understanding than most as to what a student’s perspective on a course is and you should take advantage of that. 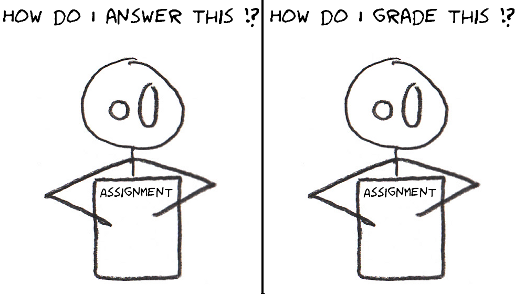 Give better feedback when you are grading – remember how you never had enough feedback as an undergrad? Provide useful comments to the lecturer from the point of view of someone who has been on the other side recently. And finally, just deliver work you know will make the grader’s life easy; it will probably help you get a better grade! Great advice for current and future graders! I always appreciate feedback, even if it’s harsh and negative. As long as it is delivered in a respectful way, it can go a long way to developing someone’s skills. Great post.